Interesting twists and turns in the NFL this week…. I have already discussed my Niners. No need to go there again. My Panthers won!!! Finally. Yes! Yes! Yes! I mean I know the New Yawk Midgets sent their little league team to play but a win is a win! The Bengals had a 14 point lead over the Vikings. Then they were down by 16. Then they won by four. Yeah, that really happened. The Cowgirls beat down the Rams. Their nation rejoices, until December. The Titans beat the Chargers. Jake Locker threw a TD pass to Justin Hunter with 15 seconds left to secure the victory. It was the first time the Titans had beaten the Chargers since 1992. I was 11. The Chiefs are 3-0 after taking down the Eagles in Andy Reid return to Philly. The Chiefs already have more wins than last year. Could they be this year’s “it” team?? Arizona could not muster up enough of anything to hang with the Saints. They were defeated 31-7 in NOLA. I hope they at least got some beignets before they left. After being the dashing darlings of the NFC last year, winning the NFC East, the Redskins look like the Redskins of two years ago. Mistake after mistake. The Lions took advantage of that and squeaked out a 27-20 victory. The Redskins are now Oh and 3. The Ravens found them some offense. The Texans apparently could not find their defense. Soooooooo, the Fins are 3 and Oh. Yeah, the Dolphins. Yes, the Miami Dolphins. who would’ve thunk it? I am sure the Falcons did not. The Jets beat the Bills. Nothing to see here folks. Seattle blasted Jacksonville. And Jaguars everywhere, in the zoo, in the wild, are embarassed. 1,143 yards passing. 12 touchdowns. No interceptions. 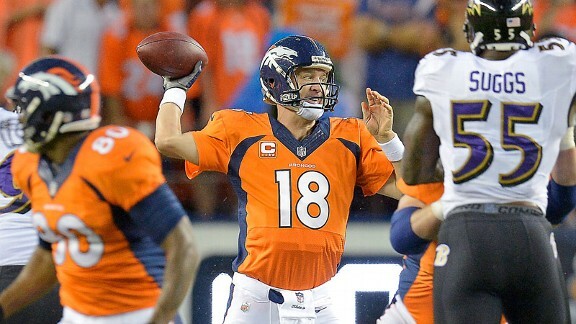 Those are Peyton Manning’s number through three games. THREE GAMES. Oh yeah and the Broncos beat the Raiders last night. Ridiculous. I owe my friend Earl Crawford an apology. During a Twitter exchange yesterday, I made the statement that “the O(Carolina Panthers) looked about the same. D looked niiiice.” My exact words. Earl’s response, ” I don’t understand….yr 1 O was on fire .. running up and down the field .. yr 3 we struggling…” Now in my defense, I was late getting home from church and I had to make a run during the game for pizza and breadsticks so I did not get to watch the whole game. It was not until I took a good look at the box score that I truly understood where Earl was coming from. My bad Earl. You were absolutely right. Yesterday’s offense was dismal. Quarterback Cam Newton completed 16 of 23 passes for 125 yards and one touchdown. Huh? Wait. What? Third year QB Newton ONLY had 125 yards? I need that to be a typo. Unfortunately, it is not. Newton did do a good job of spreading the ball around to multiple receivers, completing passes to five different players. However, that is just not enough. Now in his defense, this dismal offense was crippled by some dismal, conservative play calling. It was apparent that in order to beat the Seahawks, the Panthers were going to need a balanced attack. Surprisingly, the numbers say this is exactly what happened. 23 passing plays to 26 rushing plays. Well plays that netted yardage. So something is terribly wrong here. I saw too many dropped passes. I saw too many fumbles. And while I try not to “armchair coach,” I saw too many questionable play calls. In year three of the Cam Newton offense, there should definitely be improvement from last year. The offensive line looked better. Newton seemed to be more patient in the pocket. And Steve Smith is still the fiery, ball snatching firecracker that he has been for the past 13 years. I agree with Newton and Smith when they say ” Everybody, let’s not panic now” but hey, something has got to give or somebody is going to be giving up a job soon. Switching gears and speaking of giving, how about we give Seahawks QB Russell Wilson a round of applause. *insert applause* What sophomore slump? Wilson finished the day 25 of 33 for 320 yards and one touchdown. Things started out a little rough for Russell as he was under constant pressure from the Panthers front seven. However, once he got settled in, he managed the game like only he can. Scrambling when he needed to. Dropping back when necessary. Making throws on the run including a beautiful pass receiver Doug Baldwin. And of course, completing a beautiful game winning drive that culminated in a 43 yard touchdown pass to receiver Jermaine Kearse in the fourth quarter. That is just Russell being Russell. The other 31 teams better get used to it. Speaking of curtains, the Pittsburgh Steel curtain may be closing. My goodness. They looked awful yesterday. So did those Jacksonville Jaguars. Sheesh. Yeah Larry Fitzgerald! Snagged two touchdowns yesterday. Still top five in the WR department. The New York Jets, with the assistance of a late hit penalty, won their opener. Yeah, I have seen this Lifetime movie before. Speaking of Lifetime movies, the Dallas Cowboys one began last night with a win as well. We all know how this will play out. Maybe they will fool me. Eh, doubt it. The New England Patriots needed late game heroics to beat the Buffalo Bills. I am not sure how to even interpret that. Any Given Sunday, I guess. Well almost. Miami beat the Browns, convincingly. However, they were not very impressive. Gotta love those Fins. There was a Reggie Bush sighting in Detroit as the Lions beat the Minnesota Vikings. Bush racked up 191 yards of total offense and one touchdown. He has not produced that much offense since USC. Ok, Maybe he has but none of you would be surprised if I was right. Adrian Peterson was sighted too. Ran straight to paydirt on his first carry. From 78 yards away. Really dude? Andrew Luck’s Colts allllllmost lost to the Oakland Raiders. Heard the Raiders looked good though. And lastly, the New Orleans Saints worked that voodoo magic on the Atlanta Falcons, who were not able to #RiseUp for the occasion. Better luck next time birds.